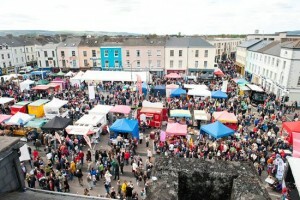 West Waterford Festival of Food centred in Dungarvan is a mecca for food lovers and fun seekers with a programme that has proven to be the perfect mix of free events and ticketed ones; an equally perfect mix of high-end dining opportunities and casual bistro experiences and it certainly offers something for all ages. This beautiful coastal town of about 9,000 people has a picturesque harbour used by leisure craft of all shapes and sizes and is further enhanced by the majestic Comeragh mountains in its background and is ready to welcome you and showcase the best the landscape which Dungarvan has to offer this April 9th – 12th. Bígí linn!